On SICAS, you can select one of the six types of payment methods to pay the SICAS processing fee and the university application fee after completing your application. Please keep in mind that ONLY when your payment has been confirmed can you send your application to the applied university for processing. 1) SICAS does not collect the tuition fees and accommodation fees, so please pay them directly to the university. 2) Please pay the fees to the account publicly stated on SICAS website. Please do not make payment to any other account. 3) Please only make the payment online through www.sicas.cn. Please do not make payment to any agent for SICAS processing fee and university application fee. PayPal is a secure, simple, and convenient way of paying. Please click the PayPal button on the webpage of “Pay/Send” when applying and follow the directions to make payment. For those who have not used PayPal before, you can create an account on their website. 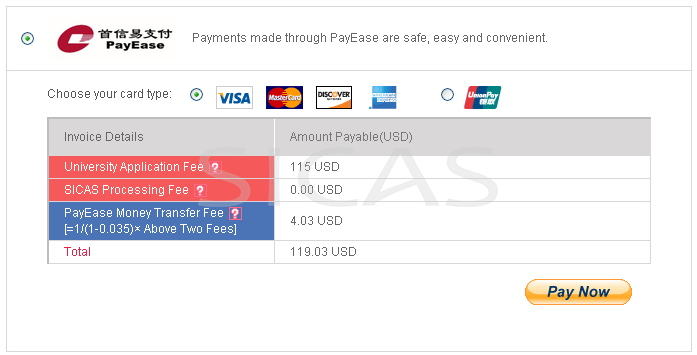 PayEase functions quite similarly with Pay Pal, but with a little bit lower transaction fee. It is a secure, simple, and convenient way of paying. Please click the PayEase button on the webpage of “Pay/Send” when applying and choose the type of card you use. Then, follow the directions to make payment. For those who have not used PayEase before, you can create an account on its website. For applicants who cannot use T/T or PayPal payments, SICAS recommends you to use Western Union (especially African applicants). You should go to the nearest Western Union service provider. You are required to complete the form provided and show your government-issued identification card or other supporting documents to the service provider. After having confirmed all the details printed on the receipt are right and true, you will be asked to sign a receipt. One of the details printed on the receipt is your Money Transfer Control Number (MTCN).It is suggested that you upload the receipt with MTCN to SICAS on the website of “Pay/Send” so that your payment can be confirmed by SICAS. After you make the payment, please inform your adviser about your payment details via whatsapp or email. Also, you can call +86-15318861816 or send an email to service@sicas.cn to inform us about your payment. Then we will confirm your payment at once and proceed to the next step of your application. For applicants who cannot use T/T, PayPal, Western Union or Payease, SICAS recommends you to use MoneyGram (especially African applicants, but for Middle East applicants ). You should go to the nearest MoneyGram agent. You will be asked to fill in the form provided by MoneyGram agent and show your National ID card.Then, the service agent will wire the money for you and give you your Reference Number and receipt. It is suggested that you upload the receipt to SICAS on the website of “Pay/Send” so that your payment can be confirmed by SICAS. Applicants who are currently in China can do a direct bank transfer to pay the application fees in CNY. Transferring money through a Chinese bank is easy and fast if you are in China or your friend is in China. If you prefer this way, please take the following bank information (written in Chinese) with you or your friend when going to the bank. The banking system needs 2-3 working days to confirm the payment. Once you complete the transfer, please upload a photocopy of your bank receipt ASAP. Applicants who are not in China can pay the application fee in US dollars by a bank transfer. Always remember to bring your invoice when going to the bank and give your application ID when you transfer the money. The banking system needs 2-3 weeks to confirm an overseas payment. Once you complete the transfer, please upload a photocopy of your bank receipt ASAP.